The project route as shown is a graphic representation and may not indicate exact locations. Starting in May 2019, Xcel Energy will begin replacing a natural gas line in Maplewood for the Northeast Metro Natural Gas Project. This year’s construction activities will occur within Century Avenue, from just south of Larpenteur Avenue to County Road B, and west on County Road B to approximately White Bear Avenue (shown on the map with the yellow and green lines). Construction will continue through November 2019. In 2020, project construction will resume with activities taking place from County Road B and White Bear Avenue to County Road B and Rice Street (shown on the map with the purple line). Xcel Energy anticipates completing the project by fall 2020. To provide additional details to the community, Xcel Energy will host a public open house to answer questions and provide construction information. Xcel Energy and the City of Maplewood are committed to keeping residents and businesses informed before and during construction. Xcel Energy will host a project website, hotline and email subscription list with regularly provided updates. They will also distribute mailers and flyers to residences and businesses near construction work areas. These are just OPEN HOUSE some of the many communications channels in place to Wednesday, April 17, 2019 ensure that the community receives information about the project. 5:30 p.m. – 7:30 p.m. (open house format) Stay informed: Website: XcelEnergyNEMetroGasProject.com Maplewood Email: info@XcelEnergyNEMetroGasProject.com Community Center Hotline: (833) 676-4369 2100 White Bear Ave.
To advertise in this newsletter call Joe Sheeran at (651) 249-2061 or email joe.sheeran@maplewoodmn.gov. AUTO SALE Choose from over 150 high quality, pre-owned vehicles from our preferred network of dealers. THE MAIN EVENT Saturday, May 4th 9am – 3pm Trade in the old & drive home the new. Buy a vehicle at our Auto Sale and receive a Road Trip Care Package. Maplewood Branch 1659 Cope Ave East Maplewood, MN 55109 Deposits federally insured by NCUA. Limit one care package per member – while supplies last. Promotion valid only on vehicles purchased at Auto Sale with a CCCU auto loan. Mr Cockriel ( center) was instrumental in several big projects to help preserve Maplewood’s historic and natural resources, including leading an effort to protect the natural wonder and archeology of the Fish Creek site. He’s also served on numerous boards, committees and task forces dedicated to research, preservation, education and outreach. all games will be played at goodrich park co-rec (minimum of 4 women per team) games start between 6pm - 9pm Playoffs take place on JUNE 18. Awards are given to the Regular Season Champ, Playoff Champ, and Playoff Runner-up. All games will be officiated. For more information, visit our website at: www.maplewoodmn.gov/1856/Adult-Kickball-League How do I register? Regulating commerce is a balancing act. As a council, we want to ensure our city is a great place to live and do business while not over regulating and creating unnecessary barriers. In the past year, weâ&#x20AC;&#x2122;ve worked to eliminate regulations that no longer served their intended purpose, taking away the fee for coin operated machines and relaxing the residential alarm permitting process. In other cases, we have found increased oversight is necessary to solve key community issues. The latest example is our ongoing effort to craft a rental licensing program. The February issue of Maplewood Living featured a story about the recent initiative. A rental licensing program will give the city one more tool to ensure rental properties are safe, comfortable, and well maintained. As someone who recently rented a home for several years, I find it interesting when talking with residents about their concerns over increased rental properties in their neighborhoods. There seems to be a perception that these properties may not be up to the standards of the rest of the neighborhood. Additionally, I have also worked with residents who are renting and are facing serious issues with the conditions of their homes. In both cases, the cityâ&#x20AC;&#x2122;s ability to step in and help solve problems is limited, and a licensing program could serve as a helpful tool toward a positive outcome. As we consider this program, we need to balance the needs of homeowners, renters, and property owners. The program should give homeowners the confidence the city is engaged and has tools to make sure rental properties are great neighbors. Renters should be assured rental properties are safe, well maintained, affordable, and welcomed in the community. Finally, the program should provide clear expectations to landlords, holding them accountable when not meeting expectations, and providing rewards when they are. There are three areas a program will need to address to be successful: 1. Public Safety: A small number of Maplewood properties experience abnormally high rates of police calls. This licensing program, along with our new Nuisance Call Ordinance, will provide more tools to encourage these problem properties to partner with Maplewood Police to solve these issues. 2. Life Safety: The licensing program will also give the city better tools and resources to effectively inspect and correct issues such as inoperative smoke detectors, building code violations, and other dangerous situations. 3. Quality of Life: Most homeowners and landlords quickly correct code violations when issued a warning. Unfortunately, when they choose not to, the judicial process can take months to resolve the issue. A good rental licensing program could give the city another resource to ensure landlords are meeting the expectations set out in our ordinances. Weâ&#x20AC;&#x2122;ve had two listening sessions, largely focused on landlords, and received great input into how to design this program. I take their input extremely seriously. We would also like to hear from more renters. Like any well-crafted regulation, balance is critical. I am looking forward to working with homeowners, renters, and landlords to strike the right balance to meet our goals for this program. I am committed to not create regulation for the sake of regulation, and am confident that by listening, remaining flexible, and getting creative we will be able to work together to find the right balance. If you have any ideas on how to make the program successful, please contact me or any of my colleagues on the council. What You Think Do you rent in Maplewood? We would like to here from you. Get engaged and fill out our initial poll by going to: polco.us/maplewood or download the Polco mobile app. Minnesota Housing announced over $60 million is available to provide affordable mortgages to first-time homebuyers, including nearly $4 million in funding for Ramsey County homebuyers. The Minnesota Housing Start Up loan program offers fixed interest rates and downpayment and closing cost loans up to $15,000 for eligible firsttime homebuyers. Buyers can purchase homes in the 11-county metro area for up to $328,200, depending on income. Minnesota Housing is a state agency that provides access to safe and affordable housing and builds stronger communities across the state. Minnesota Housing offers purchase, refinance, and home improvement loans, as well as financing for affordable rental housing throughout the state. First-time buyers can get started by visiting mnhousing.gov for a full list of approved lenders, current interest rates, and program eligibility. Our Public Works crews hit the streets mid-March for pothole repair. It’s a tricky strategy this time of year because we’re still in a freeze-thaw cycle which can mean some of the repairs won’t hold and we’ll need to fix them again. The city owns two hotboxes that allow us to run two crews who do the repairs on our 135 miles of streets. It can be slow going at first. These same crews also have to respond to localized drainage issues that occur due to snow melt and rain events. As the weather warms, and the risk of snow diminishes, we pick up steam. We understand how frustrating pothole season can be, but the city is out diligently tackling the worst problem areas first. If you have an abnormally large pothole, please let us know. Spring 2019 get my head around. The complaints I hear most often are: They are so messy! They drop fruit or seeds all over my yard. The leaves from my neighbor’s tree blow into my yard and I have to rake them! These can all be true. But there’s a flip side – the beauty, shade, habitat, yummy fruit, and the joy of the kids jumping in piles of fallen leaves. And add to that all the environmental, health and social benefits. Carver Ridge neighborhoods. The Twin Cities metro tree canopy averages 27%. What a tree canopy does Trees absorb carbon dioxide from the air, a greenhouse gas that is contributing to climate change, and store it as carbon. Maplewood trees sequester around 32 million pounds of carbon annually. That’s the equivalent of 6.6% of the carbon dioxide emitted each year by cars traveling in Maplewood. The tree canopy provides an 8.7% reduction in electricity used for air conditioning annually and a 26% reduction in natural gas used for heating annually. These are just a few of the statistics in the tree canopy report. 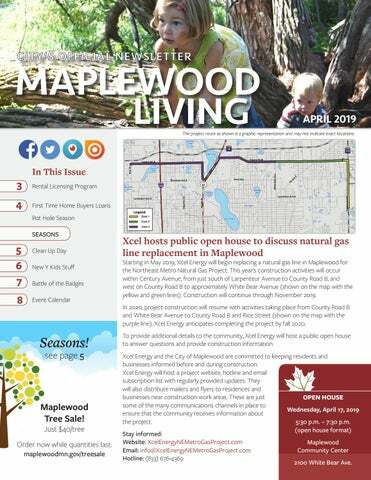 Protecting Maplewood’s canopy Maplewood went from one documented ash tree with emerald ash borer (EAB) in May 2017 to over 25 trees with EAB in April 2018. Most of these were on private land. Thousands of ash trees in the city will likely succumb to EAB and die in the coming years, a significant loss of the city’s tree canopy. Now is the time to start growing that canopy. The city has a 1:1 goal for replacing boulevard and park ash trees. To support tree planting on private land, City Council instituted the Maplewood Tree Sale. Partnering with Tree Trust, the city is subsidizing the cost of trees for residents to plant in their yards. Help grow Maplewoodâ&#x20AC;&#x2122;s urban forest. Plant a tree this year! Spending time near trees or in forests benefits human health, according to a variety of studies. Here are a few of those health benefits. Reduced anxiety, lower blood pressure: Research has linked lower blood pressure and cortisol levels – a stress hormone – to exposure to forests and trees. According to a recent National Institute of Health study, “contact with real or simulated green settings as opposed to [manmade] settings has positive effects on mood, self-esteem and self-reported feelings of stress and depression.” Faster Healing: Several hospital studies have found a window view of a tree can lessen the amount of time spent healing from surgery. Air Pollution Filter: Tree leaves absorb smog, particulates, and many other pollutants, which can cause respiratory illnesses. The US Forest Service scientists and collaborators calculated that trees prevent 670,000 incidences of acute respiratory symptoms each year in the US, and prevented 850 deaths from those incidents. Heat Stroke Protection: Trees provide a cooling effect in the summer of 2-4 degrees Fahrenheit, says Rob McDonald, lead scientist for global cities at the Nature Conservancy. In a heat wave, that can be the difference that leads to heat stroke, especially for the elderly. Trees and insects have a long history together. Just like in a good marriage, each has adjusted to the other’s needs and quirks, and learned to live and thrive together. Trees native to Minnesota or North America have evolved with certain species of bugs. The trees have developed defense mechanisms that keep insect damage to a minimum. But our native trees don’t necessarily have defenses for bugs from other parts of the world. Emerald ash borer, for example, is from Asia where it does minimal damage to ash trees. In North America, the ash trees cannot survive it. Most insect guests do minimal damage to trees while providing an abundance of food for songbirds. One of the nation’s leading researchers and authors on this issue, Doug Tallamy, advocates for planting native trees instead of exotic trees from other countries because they can host dozens if not hundreds of species of insect life. Here’s one example. Caterpillars – the larvae stage of moths, some flies and butterflies – contain fats and proteins that make them a rich and sought-after food source for songbirds, both seed and insect eaters. According to Tallamy, 96% of terrestrial birds feed insects to their young. Tallamy observed and counted at least 6,000 caterpillars collected and brought to chickadee nestlings over an 18-day period. In our area, native willow, cherry, birch and oak make up the keystone genera – the trees that host the highest number of species of moths and butterflies. 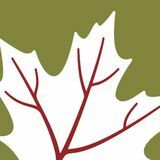 Tallamy’s website Bringing Nature Home features a Native Plant Finder that lists species appropriate for your area. It also lists and shows pictures of the moths and butterflies that depend on them. But wait, aren’t there enough native trees in our parks and open spaces? Why should a private landowner need to do anything? The fact is our native pollinators and insects are disappearing. About 60% of land in the United States is privately owned. Planting just one tree native to the area can make a huge impact towards sustaining biodiversity. How do you find native trees to purchase? The city is offering both native and non-native trees at the Maplewood Tree Sale this year. For more choices, seek out a nursery specializing in native plants. Growing your own from seed is also an option. Thanks to a squirrel or blue jay, a volunteer red oak in my yard grew to 7 feet in 3 years – free of cost and no effort! For a full list of items accepted and fees, visit maplewoodmn.gov/ cleanups or contact Shann Finwall, Environmental Planner, at (651) 249-2304 or shann.finwall@maplewoodmn.gov. Cooler play equipment, expanded space Check out the new Kids Stuff at Maplewood YMCA Community Center To better serve the whole family, Maplewood YMCA Community Center built an expanded Kids Stuff space. The upgrade provides more engaging equipment for children between 6 weeks and 10 years old. It features a large play structure for them to crawl, climb, and slide. A more infant- and toddler-friendly space has been created, with more areas for toys, crafts and staff to keep them busy. At 1,560 sq. ft., it’s more than four times bigger than the old space. The YMCA has a great pool, and a wonderful gym, but was missing options in that early elementary school age range. It’s great for a parent to know their child will have a fun, engaging time while they work out. Over the last two years we’ve upgraded our cardio equipment, expanded studio space, renovated the family locker room, installed new carpet and painted. We continue evaluating the branch’s needs for future improvements. It’s important the Maplewood YMCA Community Center stay relevant as other facilities improve. Maplewood is an aging community, but we’re noticing many younger families are moving in because of Maplewood’s wonderful opportunities and quality of life. As a community leader, it is essential that we serve all. Bean Bag Toss League At Four Seasons Park • 1685 Gervais Grab a partner and join other teams in throwing some bags in a fun bags league. Games are played outdoors at Four Seasons Park. Teams consist of 2 players and each week teams will play a match consisting of 3 games. Games times, 6:30pm - 8:30pm. League champions will receive champion t-shirts. Upon request, this newsletter will be made available in an alternate format. Printed on 10% post consumer product. Go to MaplewoodMN.gov. Our home page calendar has details on upcoming events. PREHUNT ACTIVITIES • 10:00AM HUNT: AGES 3-5 • 11:00AM AGES 6-8 • 11:30AM The morning features: Breakfast treats  Bounce castle  Colorful crafts  Goodie bags available for children under two  Easter Bunny visit Children will hunt for wrapped candy and plastic eggs, some of which may be redeemed for great prizes. If there’s inclement weather, treat bags will be given away at 11:00AM at the Edgerton Community Gym.